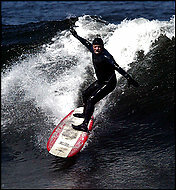 Remember that Bodega Bay surfer with the 45-pound wax ball from the 2003 film Step into Liquid? The one who paddled out every day for the last 28 years or so? He’s still at it, and he is as stoked about surfing as ever. If you have yet to hear about Dale Webster, he is a 59 yr. old man from Valley Ford, Calif who has paddled out to surf for 11,925 consecutive days and counting. That’s correct…..11,925 consecutive days of surfing. My first knowledge of Webster’s world-record streak came from the first time that I watched Step into Liquid. When I stumbled upon SI.com’s Chris Ballard’s recent article on Webster’s ever-growing run, I found myself once again trying to wrap my head around the passion that this man has for surfing. It’s truly immeasurable, and it may also be unmatchable. Think about that for a second…. What would you say your longest run without missing a day in the water is? I consider myself extremely passionate about surfing, yet I know there are many times that I go through periods where I’m not as eager to paddle out as I should be, and I usually end up finding some excuse to stay out of the water. Dale Webster on the other hand…..well he has truly surfed through it all. Inclement weather, White Sharks, kidney stones, and a countless number of other obstacles that would keep you and I from even considering the thought of paddling out for a session. Taking on a streak of this magnitude isn’t something I would highly recommend, and I’m not quite sure Webster would either. But the next time you find yourself with free time yet for whatever reason find it hard to get charged up to paddle out remember this – Dale Would Go. He has for the last 32 years straight. Posted by Shaun	on Monday, April 28th, 2008	in Surfing. -Have you met the 5ones team yet? I watched Step Into Liquid, as well, and first learned about this. I have been wondering if he’s still going- thanks for the update! That is really amazing! Do you know how old he is?